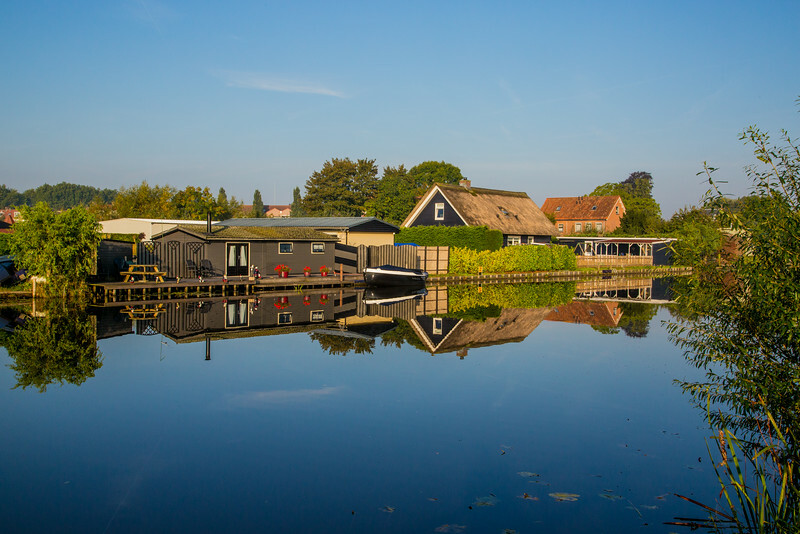 There's nothing as peaceful as looking down the length of one of these beautiful canals. 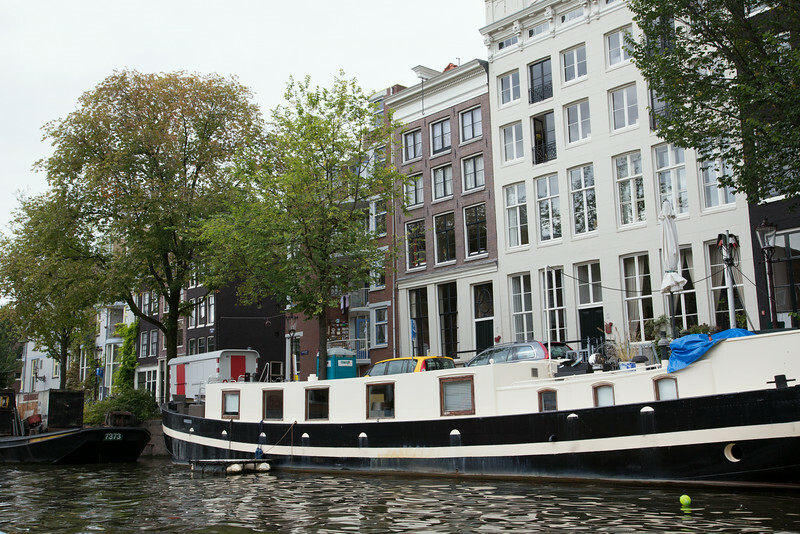 Lots of these houseboats line the canals of Amsterdam. 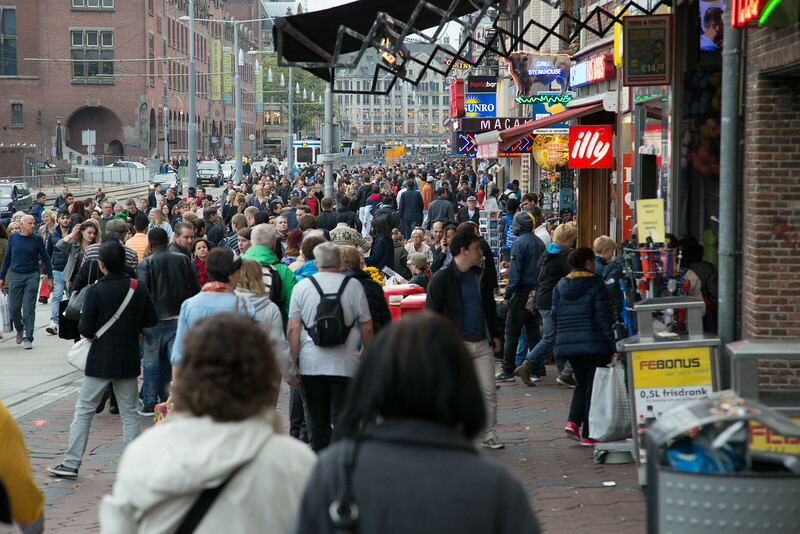 The streets are jammed, and not just with tourists. There really are red lights in this district, where prostitution is legal. 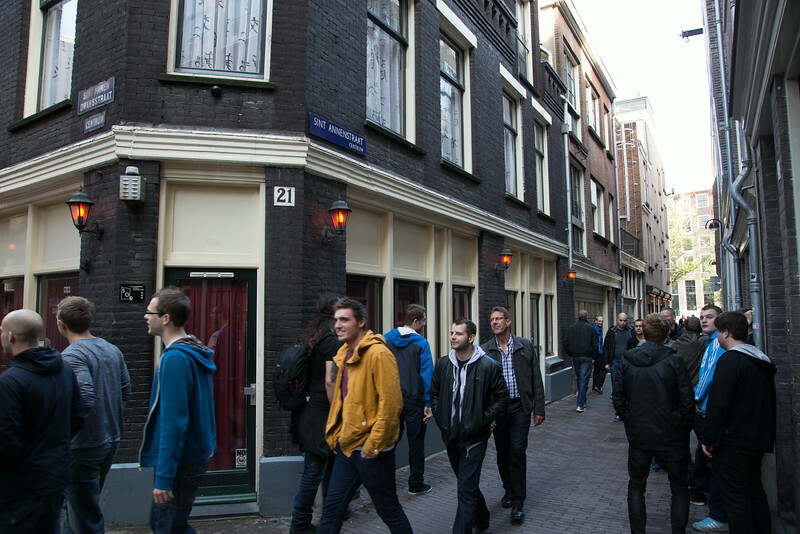 Photography is discouraged, so you won't see any photos of the women who were standing at their windows as we passed by. 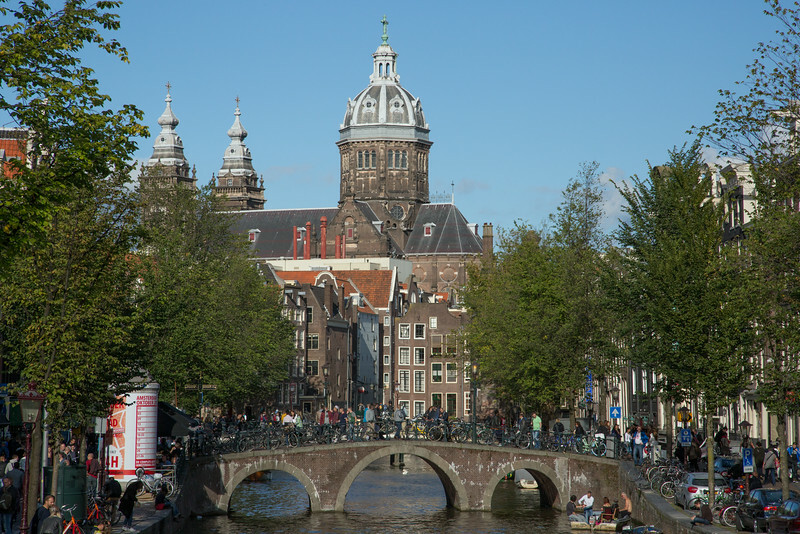 Amsterdam is a city of canals, bridges, and beautiful old buildings. 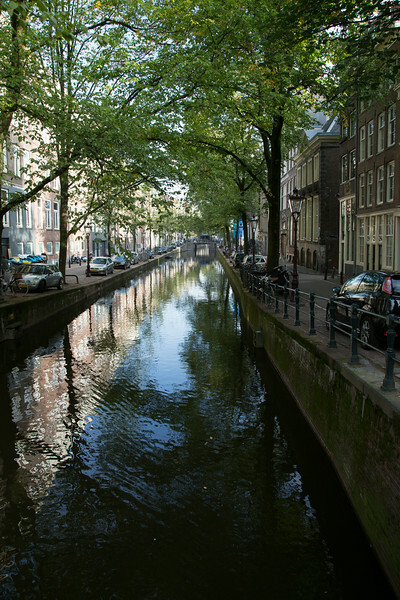 Amsterdam is a city of canals, bridges, and beautiful old buildings. And bicycles, as can be seen on the bridge. 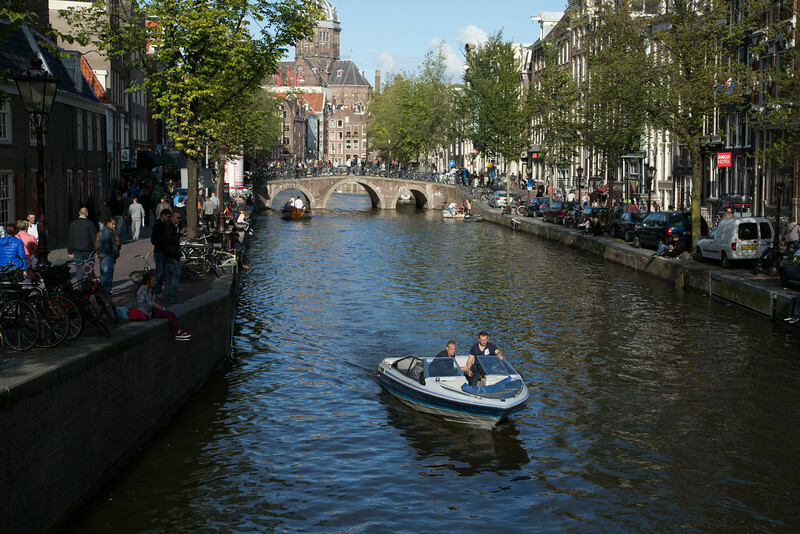 Since photography is discouraged in the red light district, I shot from across the canal with a telephoto lens. 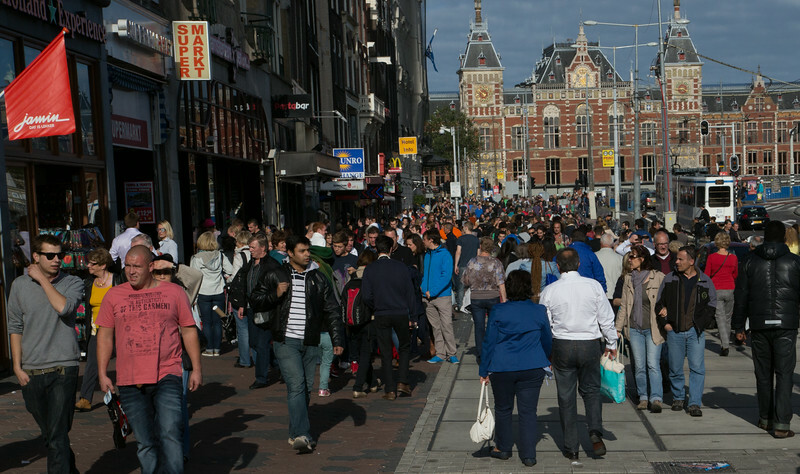 The streets of Amsterdam are really crowded, and not everyone is a tourist. 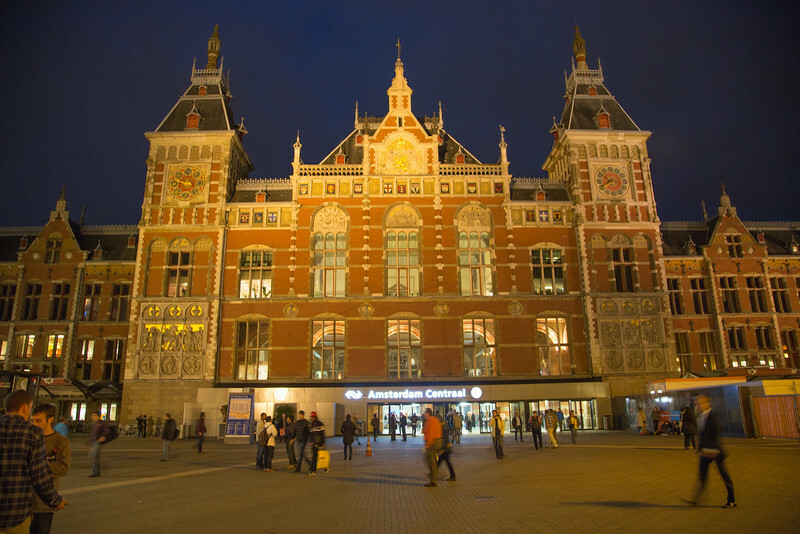 The main train station is nicely lit up at night. 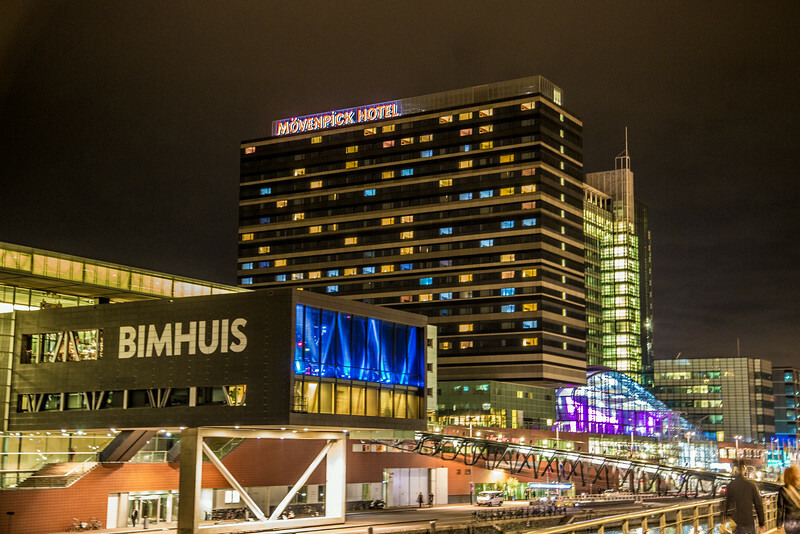 We stayed at the Movenpick Hotel, located adjacent to the dock where Viking River Cruises picks up its passengers as they begin their Grand European Voyage. 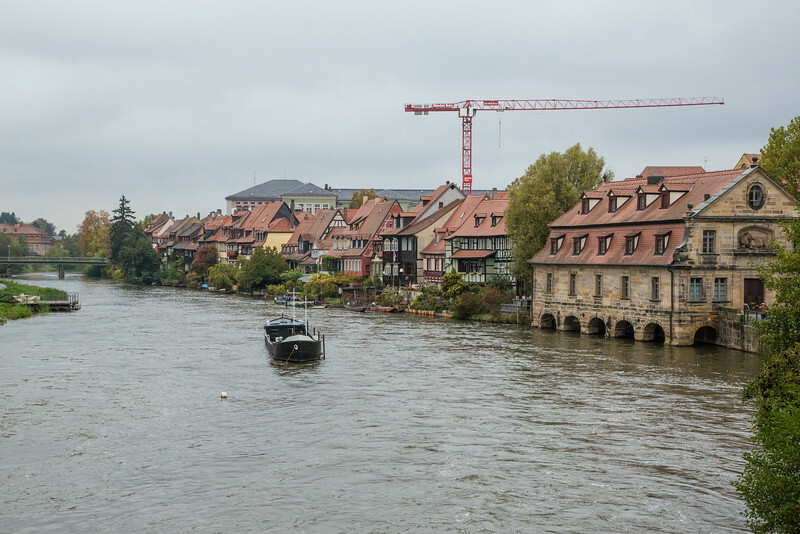 Bamberg's massive Cathedral of St. Peter and St. George (also known as the Kaiserdom) opened in 1012 AD. We couldn't get too close because a crew filming a movie, complete with horses< had taken over the square in front. 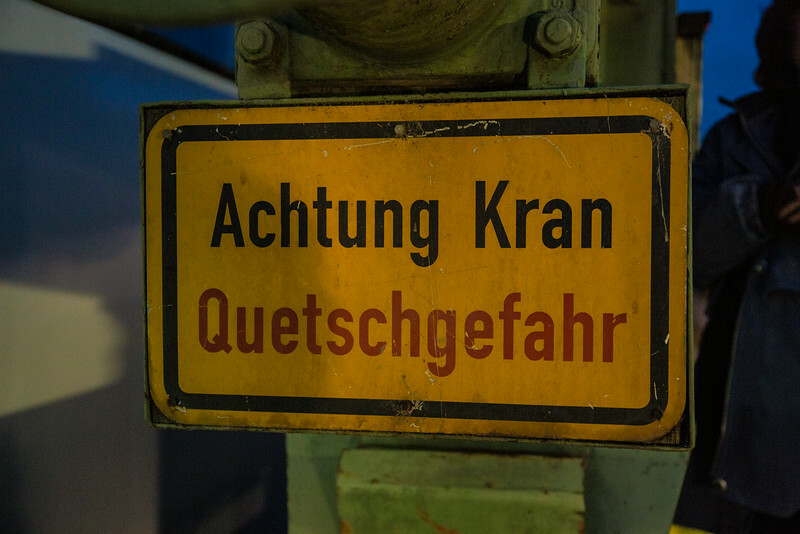 This sign warns to be aware of the crane because there is the danger of being squished. Construction of the modern castle began in the 10th century, but the site had been used as a fortress for centuries earlier. 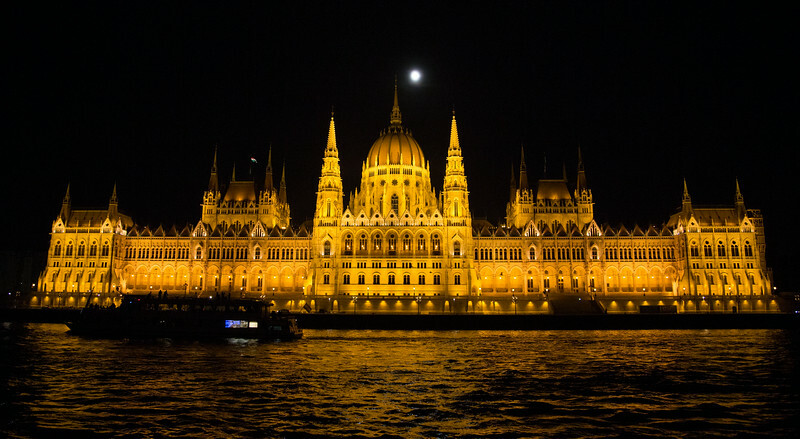 It fell into disuse after the fall of the Hungarian Kingdom, but was finally restored, beginning in 1957. 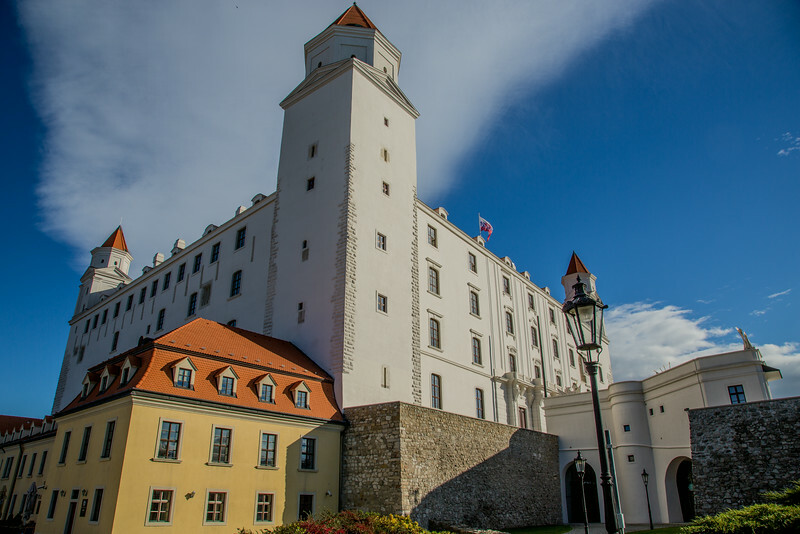 As seen from the Castle of Bratislava. 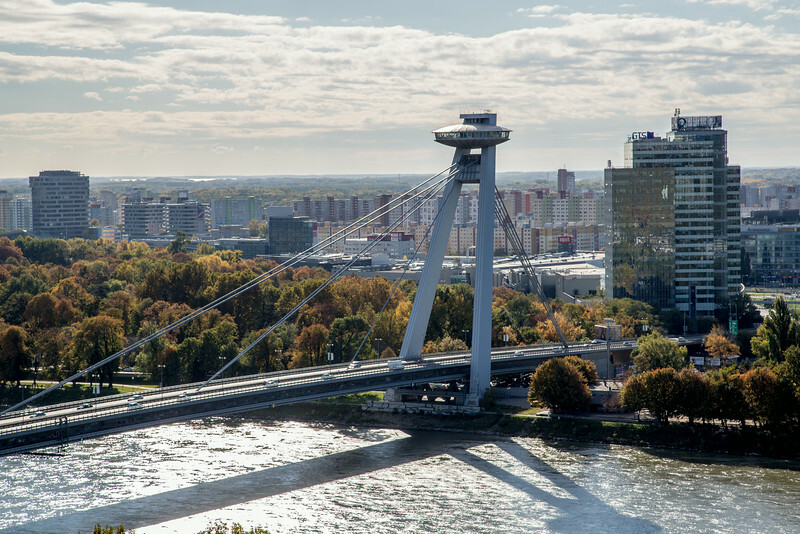 The bridge, now known as "Most Slovenského národného povstania" (Bridge of the Slovak National Uprising) is nicknamed the "UFO Bridge", because of the shape of the restaurant at the top of the tower. 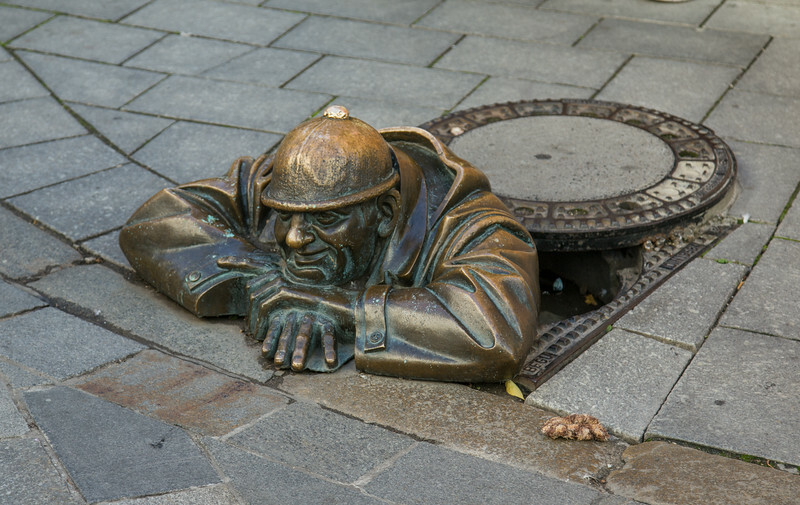 One of Bratislava's delightful street sculptures. Created in 1997, this one is known as "Cumil", the Rubberneck statue. 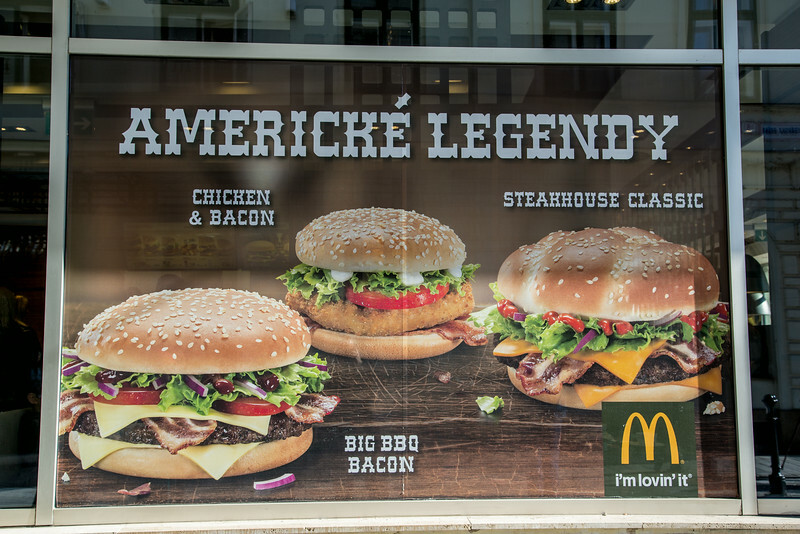 They don't try to hide McDonald's country of origin. 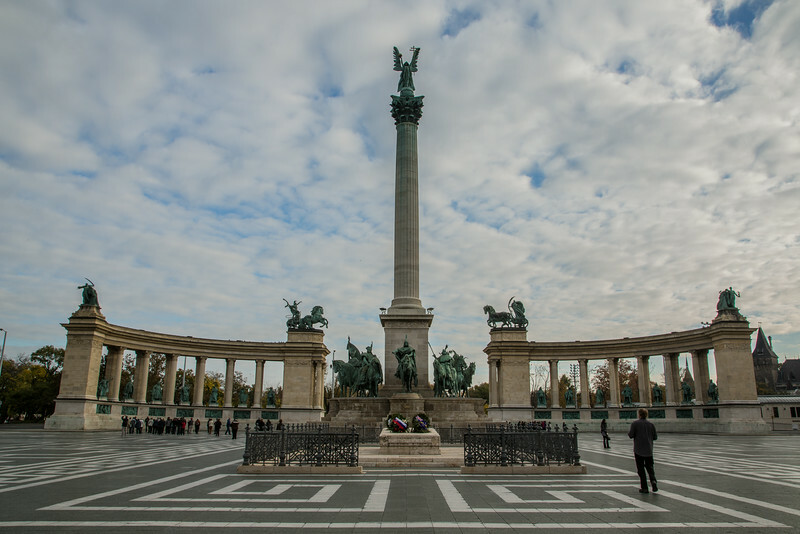 noted for its iconic statue complex featuring the Seven Chieftains of the Magyars and other important national leaders, as well as the Tomb of the Unknown Soldier. 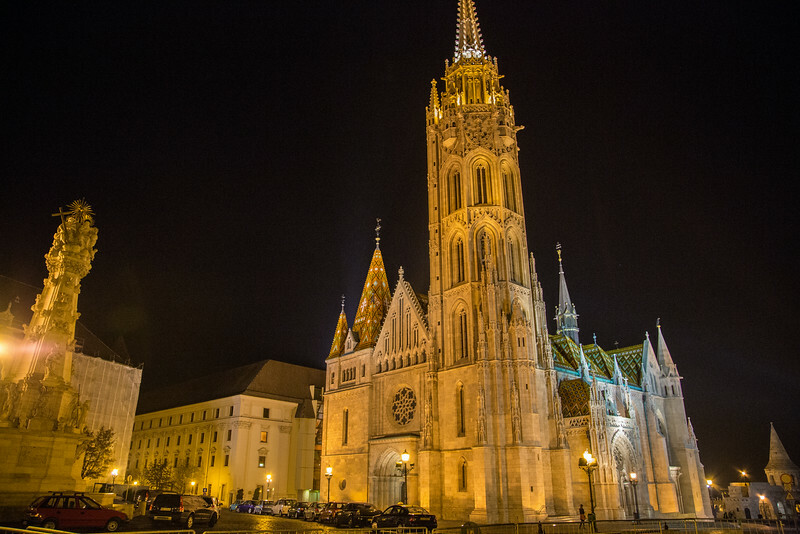 Construction began in 1896 to commemorate the thousandth anniversary of the foundation of the Hungarian state by St. Stephen I in 896 AD. Budapest's Fisherman's takes its name from the guild of fishermen that was responsible for defending this stretch of the city walls, above the Danube River, in the Middle Ages. The bronze statue is of Stephen I, was erected in 1906. He was the last Grand Prince of the Hungarians in the 11th century, and the first King of Hungary until his death in 1038. 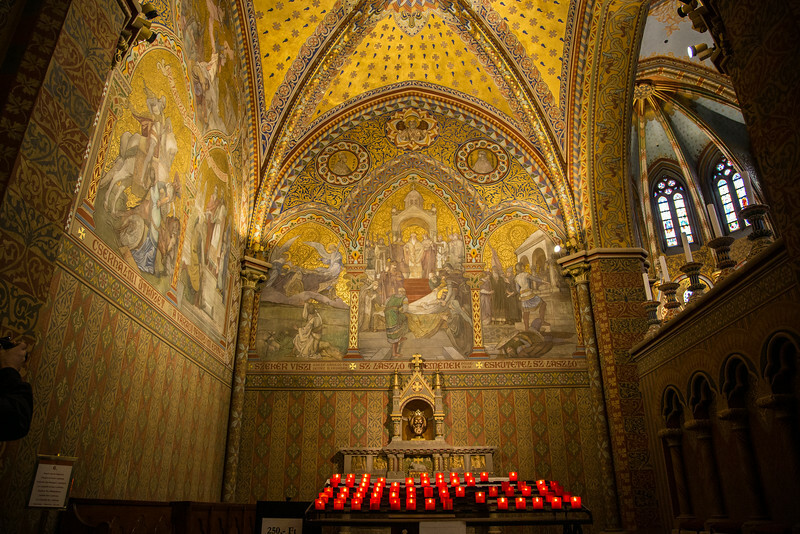 The St László chapel in Budapest's Matthias Church. 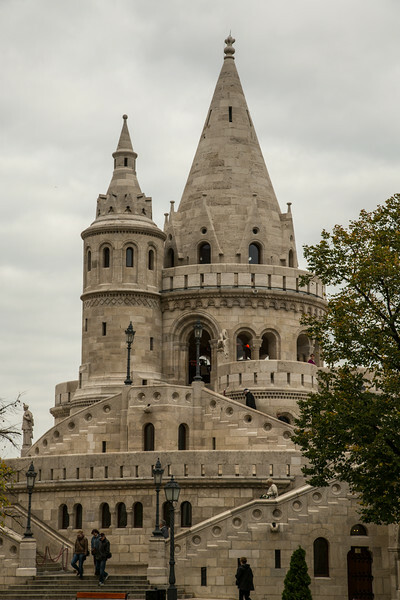 One of Budapest's Fisherman's Bastion's seven towers, each representing the seven Magyar tribes that settled nearby in 896 AD. 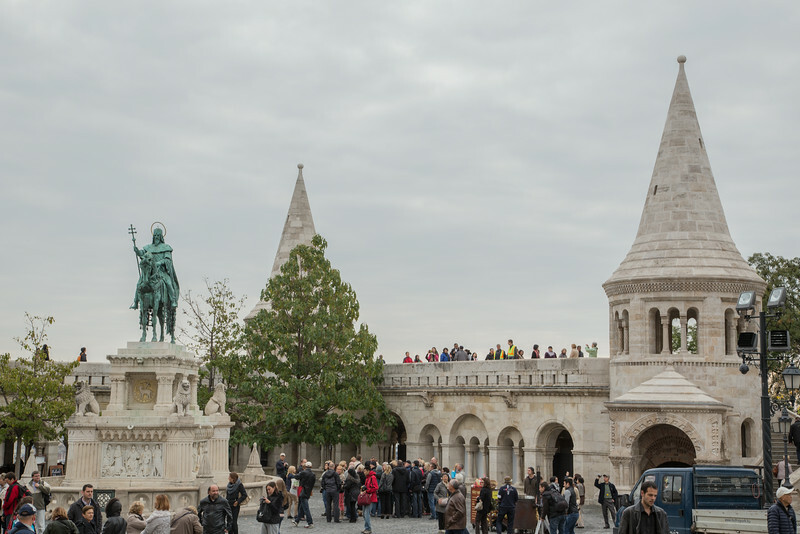 The monument is located on Castle Hill overlooking the Danube River. 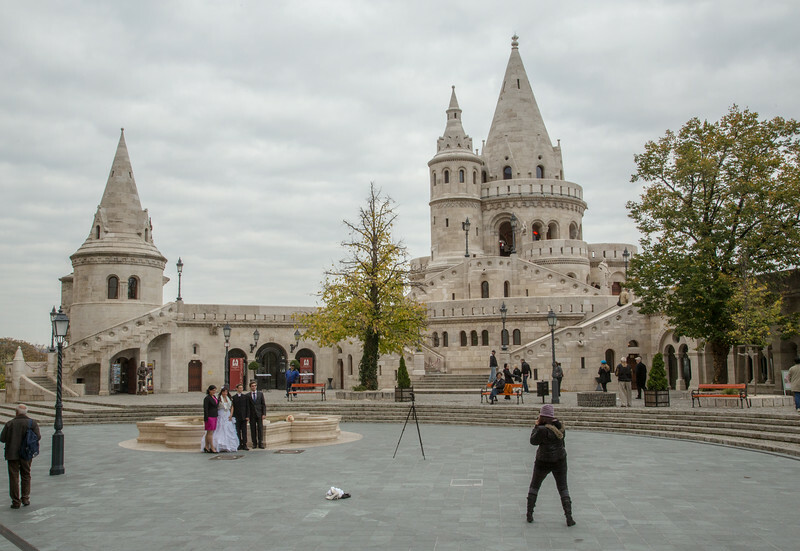 Budapest's Fisherman's Bastion is the backdrop for these wedding photographs. 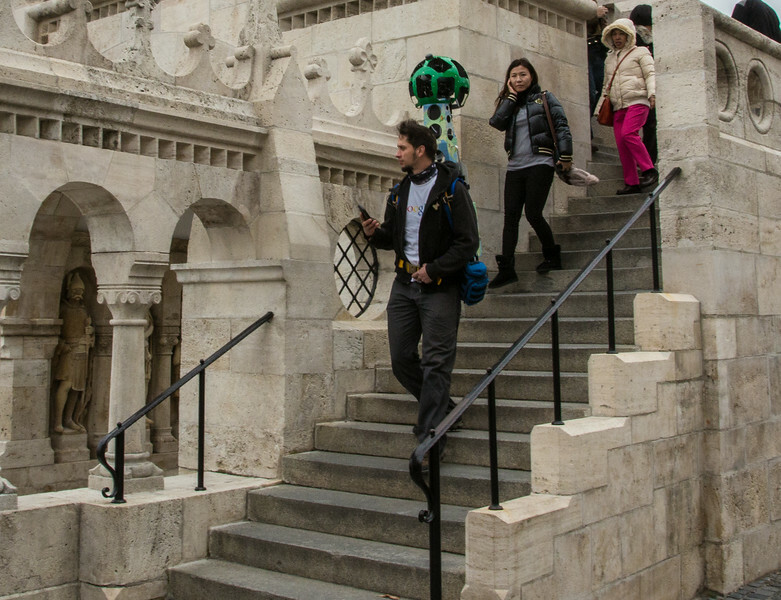 This is how Google Maps can accurately portray the sights of Budapest's Fisherman's Bastion. 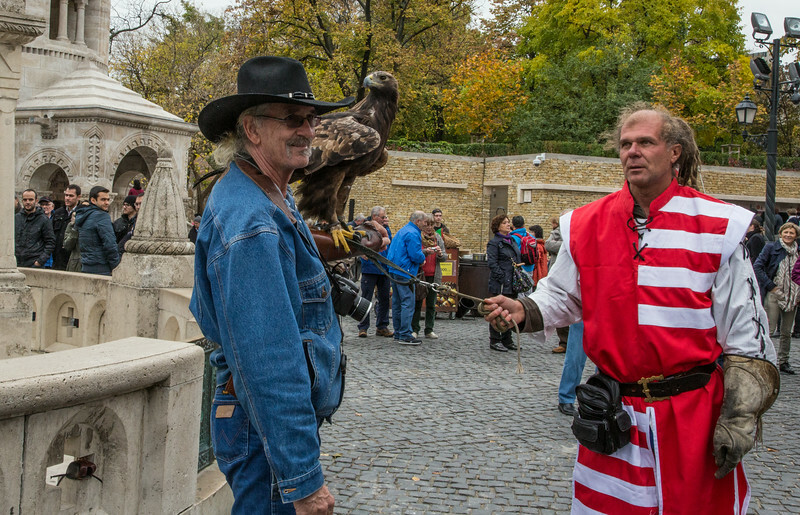 Among the many tourist delights of Budapest's Fisherman's Bastion was this costumed falconer, who didn't seem too eager to let a Texan pose with the bird. 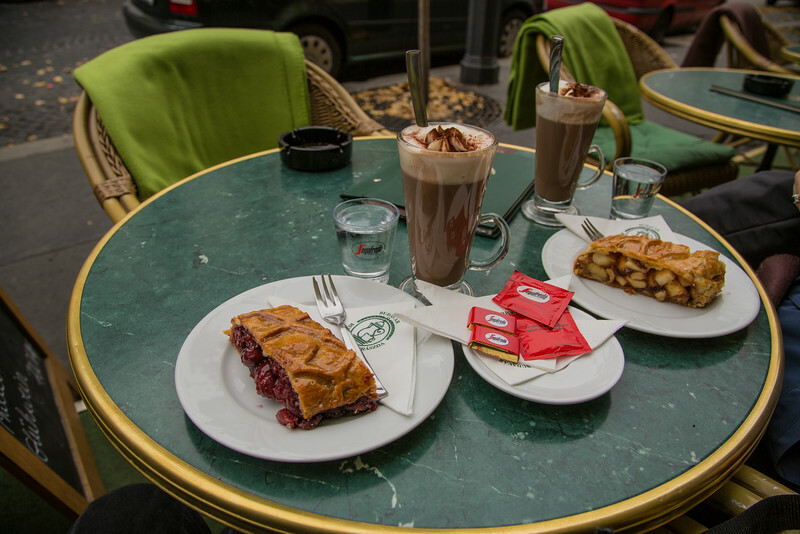 Restaurant named "Ruszwurm Cukrázda" claims to make the best hot chocolate in the world. And you know what? They're right. It was delicious. 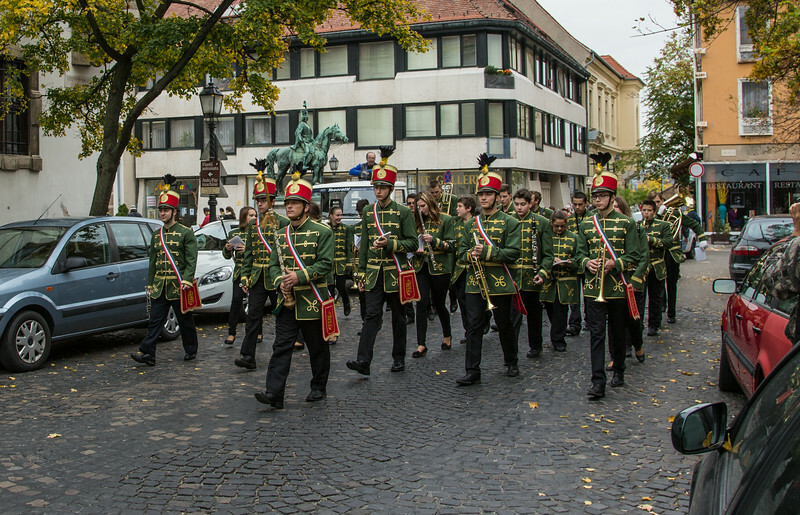 This youth marching band came past us as we were enjoying an afternoon snack near Budapest's Fisherman's Bastion, but unfortunately, they weren't performing. Beer, Coke, burgers and fries. 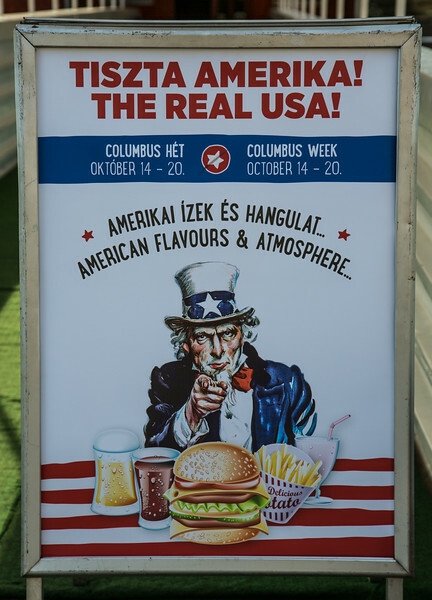 That's what this Budapest restaurant considers typical American fare. But then they spelled flavors the British way. 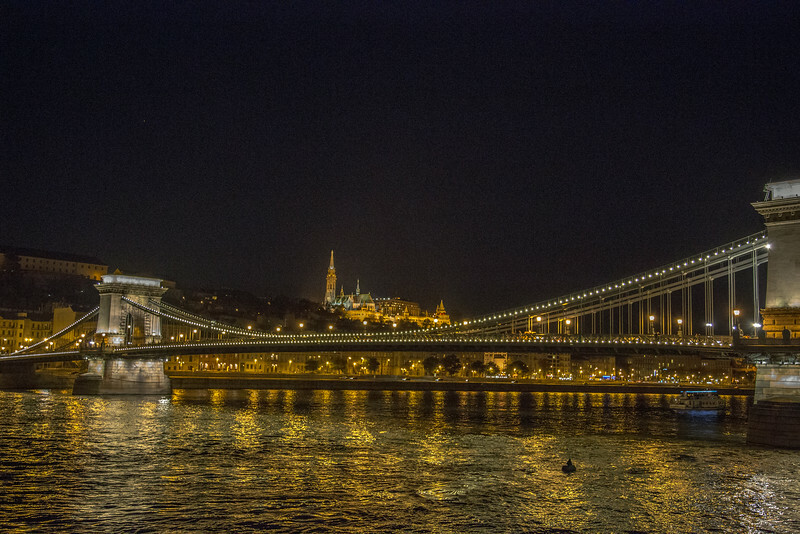 The Chain Bridge, crossing the Danube River, is in the foreground, framing the Matthias Church. Construction on the building began in 1885. 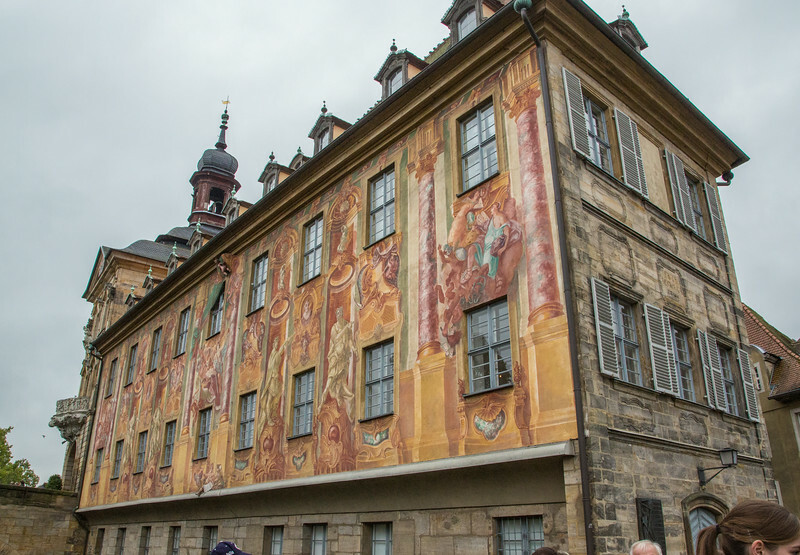 It is one of Europe's oldest legislative buildings. 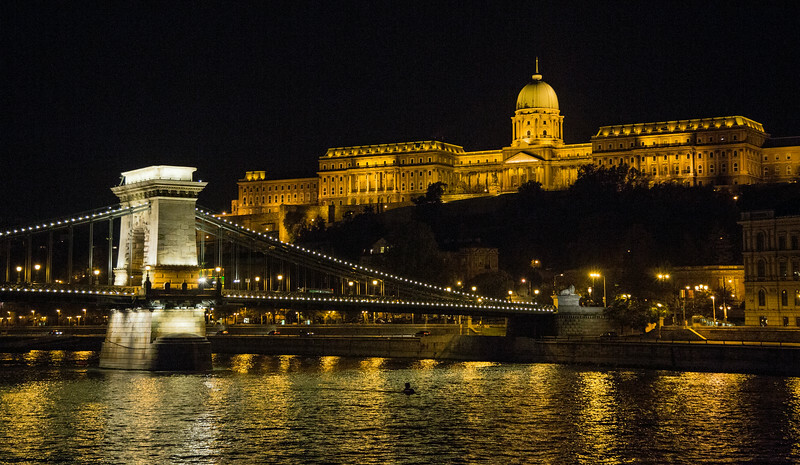 Buda Castle is the historical castle and palace complex of the Hungarian kings in Budapest, and was first completed in 1265. The Chain Bridge, across the Danube River, is in the foreground. 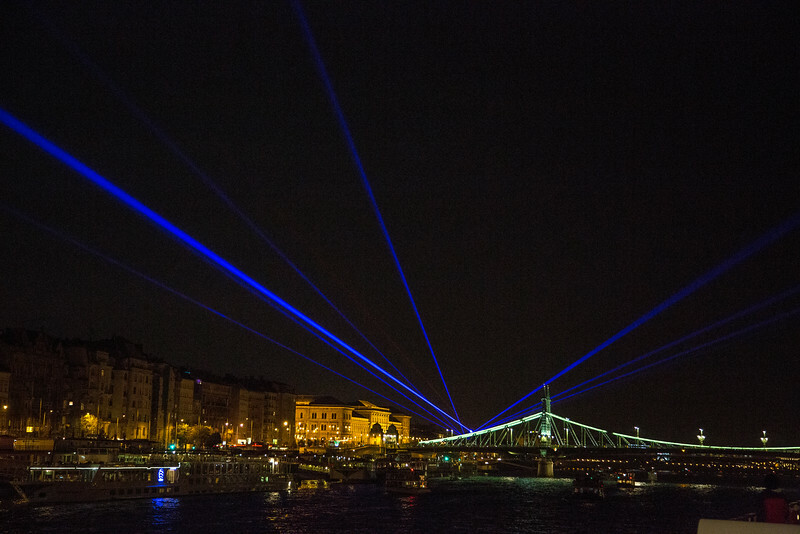 Lighting up the sky over the Danube River, this laser show emanated from a Budapest amusement park. 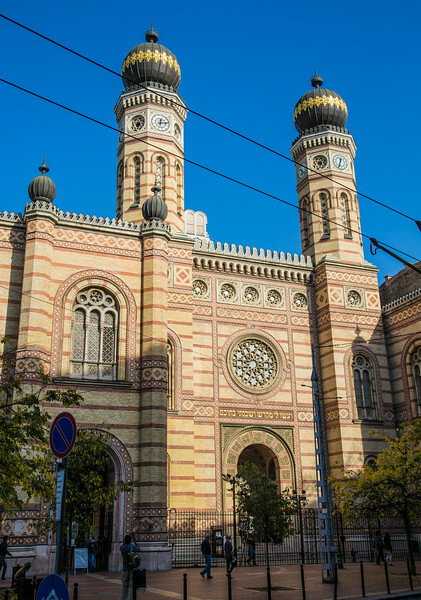 The Dohány Street Synagogue is the largest in Europe with a capacity of 3,000. It was built in the mid-1850s. An adjoining Jewish museum was added later on the spot where the father of Zionism, Theodore Herzl, was born in 1860. 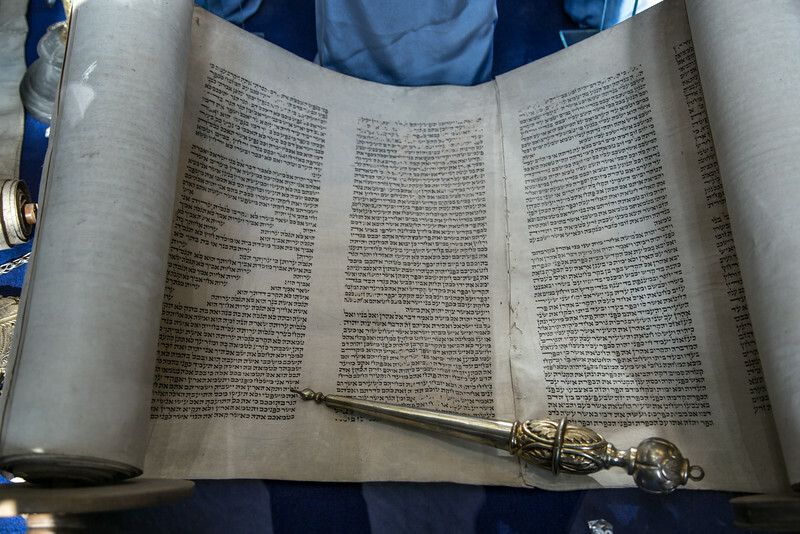 This Jewish scroll is displayed in the Jewish museum, which was built next to Budapest's Dohány Street Synagogue. 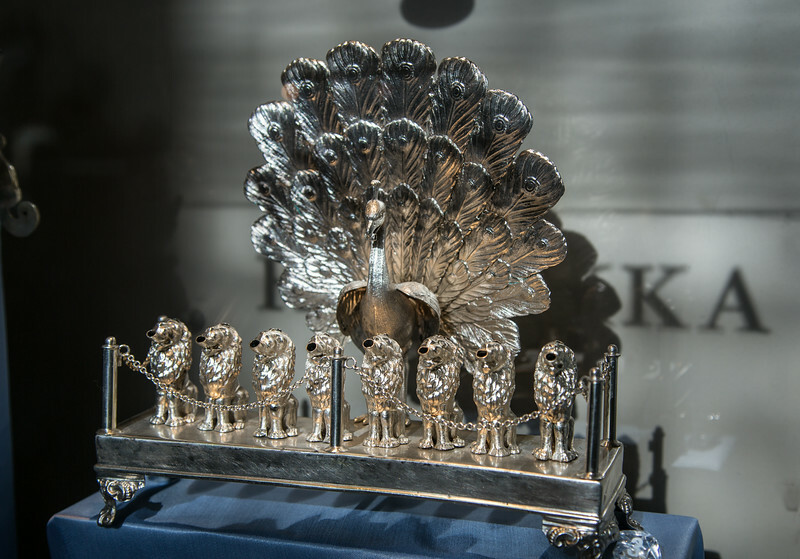 This silver menorah was displayed in the Jewish museum, which was built next to Budapest's Dohány Street Synagogue. 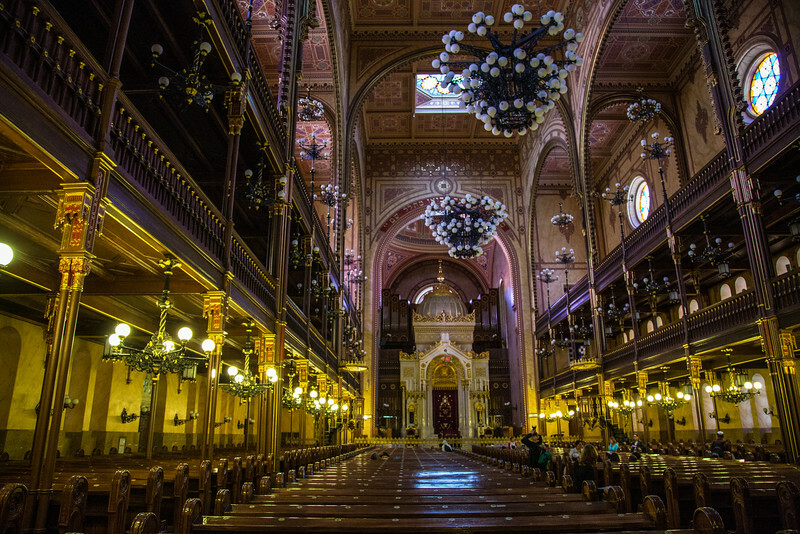 The Dohány Street "Great" Synagogue is the largest in Europe with a capacity of 3,000. It was built in the mid-1850s. Women are exiled to the balcony. 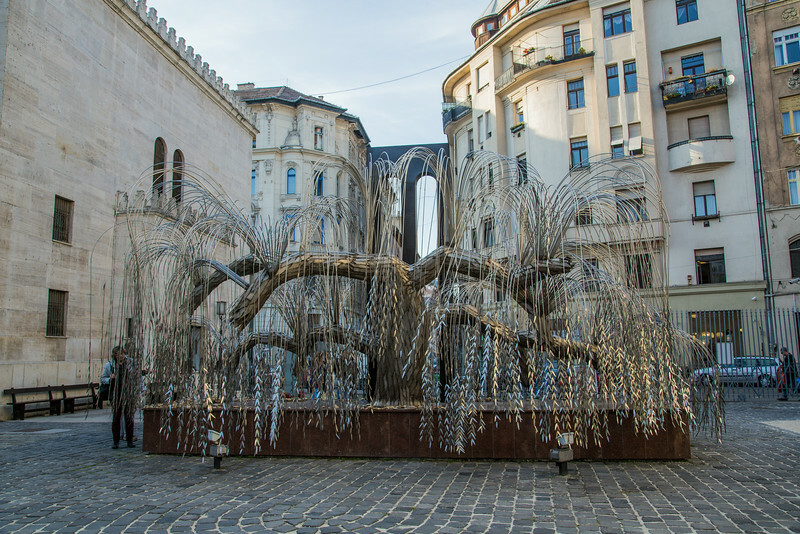 Willow tree memorial to Budapest's victims of the Holocaust. It is located in the Raoul Wallenberg Holocaust Memorial Park, with this beautiful sculpture, with the "tree's" leaves engraved with the names of Holocaust victims. The sculpture was endowed by an American actor named Bernie Schwartz, aka Tony Curtis, whose parents were from Hungary. Wallenberg was a Swedish diplomat credited, along with others, with saving thousands of Jews from the Nazis. 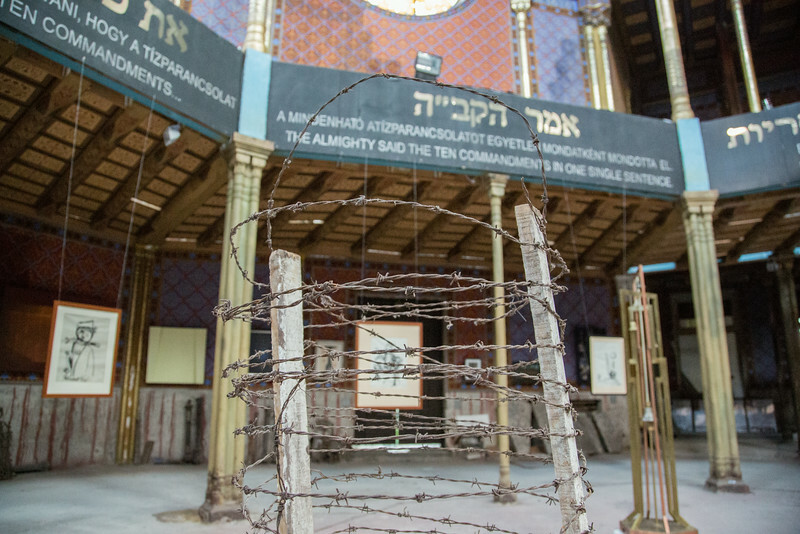 Located a few blocks from Budapest's Dohány Street Synagogue sits this dilapidated temple originally constructed in the late 1800s by the Neologs, a group favoring a more liberal observance of Judaism. It's currently in a state of disarray because there's no money for renovation. 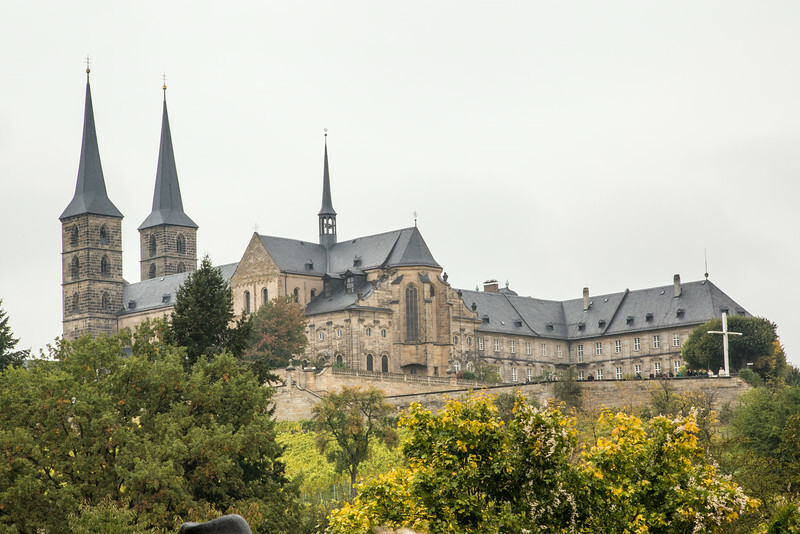 The church is named after King Matthias. 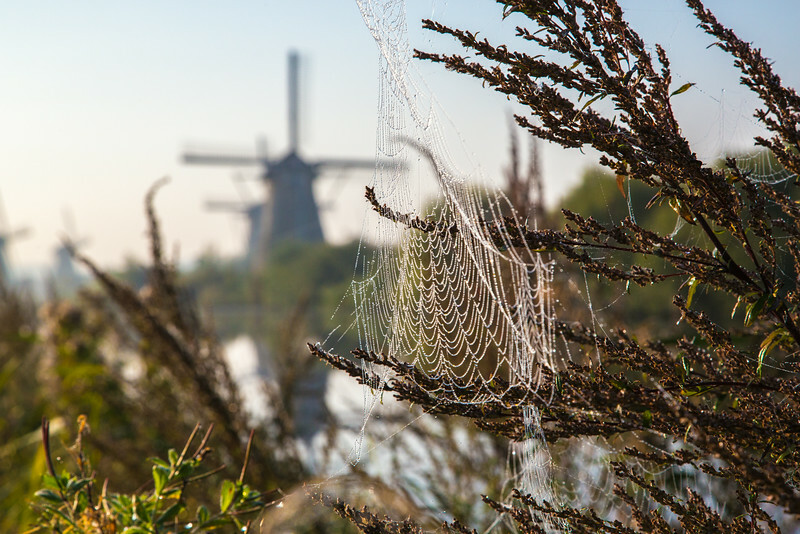 It was originally constructed in 1015. 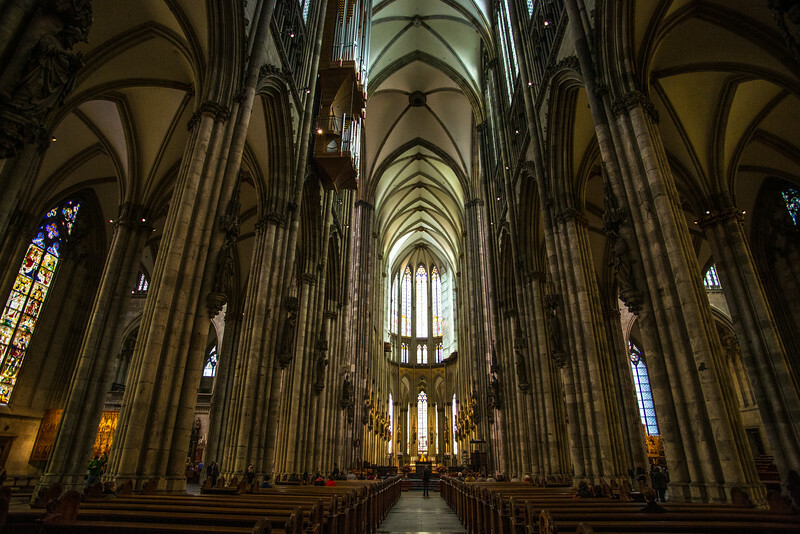 The current building was constructed in Gothic style in the second half of the 14th century and was extensively restored in the late 19th century. 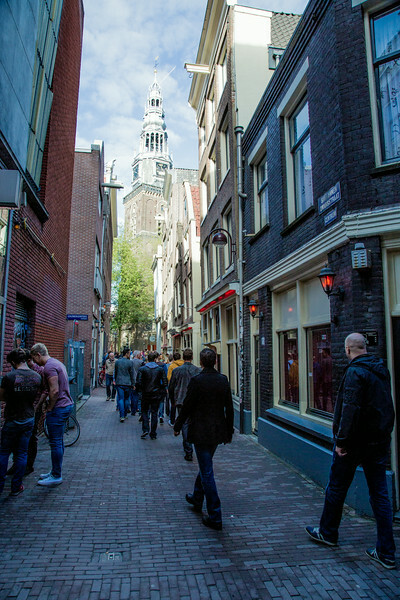 The building slightly to the left of the church is a Hilton Hotel. 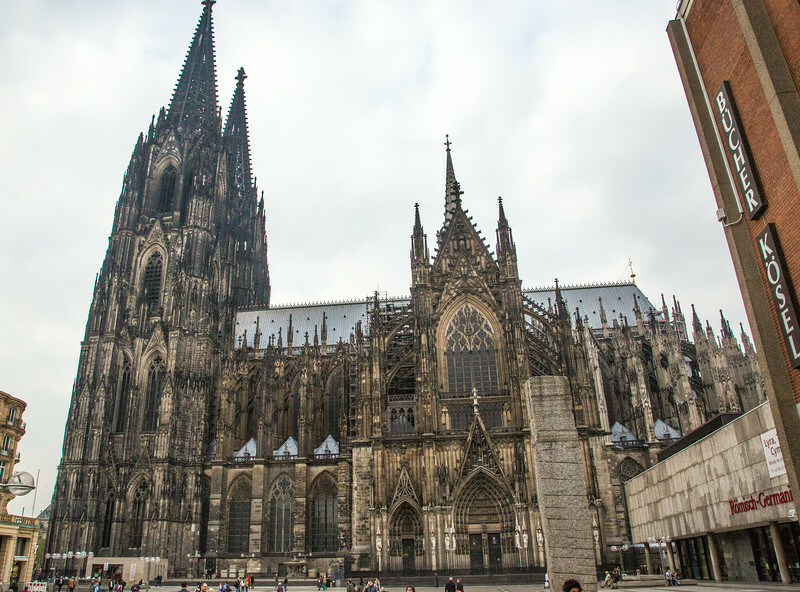 The famous cathedral in Cologne. It's been around in some form since 1248 AD. 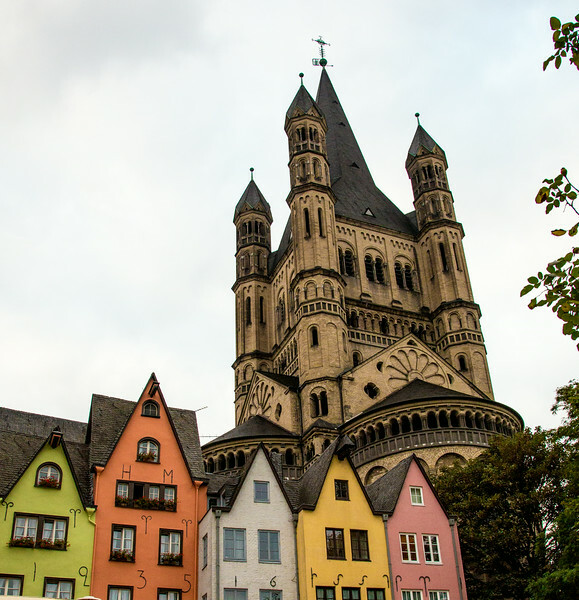 Church towers over restored old riverside homes in Cologne, Germany. The Viking River Cruise longboat Bragi gets ready to dock in Cologne, Germany.